More than 15 of the suspects are wanted Hamas members, IDF troops close down printing press used for disseminating incitement. The IDF, in conjunction with the Border Police and the Shin Bet, arrested 19 terror suspects on Saturday night. 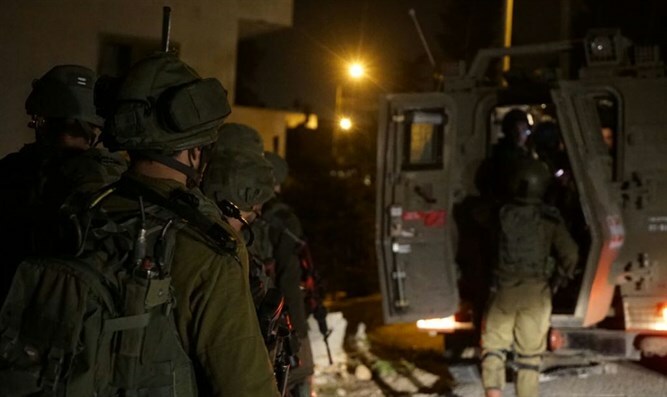 The operation took place in the Ramallah area and the IDF says that 15 of the suspects are wanted Hamas members. According to the IDF Spokesperson's Unit, the Hamas members were arrested after they were found to be in contact with Khaled al-Din Hamed, a Hamas activist from the Gaza Strip, and other senior officials who were instructed to perform various tasks on behalf of the Hamas terrorist organization in Judea and Samaria. IDF forces also shuttered a printing press that was used by Hams to publish and disseminate incitement. "The exposure of the activity once again demonstrates the ongoing attempts by the Hamas terror organization based in the Gaza Strip to initiate terror activity in Judea and Samaria by transferring funding, providing targets and disseminating messages, without taking into account the impact on the fabric of life of the Palestinian residents in Judea and Samaria," said a statement by the IDF's Spokesperson's Unit. "The IDF and Shin Bet will continue to act decisively against all terrorist activities in Judea and Samaria, and against terrorist operatives who will be in contact with Hamas terrorist operatives in the Gaza Strip."